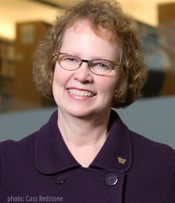 Lizabeth (Betsy) Wilson is the Vice Provost for Digital Initiatives and Dean of University Libraries at the University of Washington in Seattle, Bothell, and Tacoma. The University Libraries ranks among the largest and most innovative academic libraries in the United States with collections of more than 9 million volumes. From 1992 through 2000, she was the Associate Director of Libraries for Research and Instructional Services at the University of Washington. Prior to joining the University of Washington in 1992, she was the Assistant Director of Libraries for Undergraduate and Instructional Services at the University of Illinois at Urbana-Champaign. Betsy Wilson has published and presented widely on information literacy, teaching, learning, and technology; cross-sector collaborations; art historiography; global libraries; and assessment and evaluation. She has held numerous leadership positions in the American Library Association (ALA) and the Association of College and Research Libraries (ACRL), including chair of the ACRL Instruction Section, member of ALA Council, and ACRL President (2000-2001). She helped establish the ACRL Institute for Information Literacy which is "dedicated to playing a leadership role in assisting individuals and institutions in integrating information literacy throughout the educational process." She is a past member of the Board of Trustees of OCLC, a nonprofit, membership organization serving over 55,000 libraries and knowledge institutions worldwide and dedicated to the public purposes of furthering access to the world's information and reducing information costs. She served as Board Chair from 2003-2007, during which time she led the effort to bring OCLC and the Regional Libraries Group (RLG) together to deliver compelling value and services to research universities. She is the immediate past chair of the Orbis Cascade Alliance, a regional consortium of 37 academic libraries in the Pacific Northwest that leverages their collective collections and purchasing power to expand information access for scholarship, research, and learning. She currently is a member of the Council on Library and Information Resources (CLIR) Board, and the Governing Board of the HathiTrust, and has served on the Association of Research Libraries (ARL) Board, the Digital Library Federation (DLF) Executive Committee, and as Chair of the Greater Western Library Alliance (GWLA). She is the recipient of the Hugh C. Atkinson Memorial Award, Miriam Dudley Instruction Librarian Award, the Margaret E. Monroe Award, the Distinguished Alumnus Award from University of Illinois' Graduate School of Library and Information Science, and the ACRL Academic/Research Librarian of the Year. With her UWired colleagues, she received the inaugural EDUCAUSE Award for Systemic Progress in Teaching and Learning. Her library was selected as the 2004 ACRL Excellence in Academic Libraries Award recipient. She holds an M.L.S. from University of Illinois at Urbana-Champaign and a B.A. from Northwestern University.